Forget about fast food. Arizona has plenty of fried chicken spots that hold their own against Colonel Sanders. These renowned spots dish up the crispiest, most tastefully battered chicken in the state. Pick a side dish and gear up for the best fried chicken spots in Arizona! Lo-Lo’s Chicken and Waffles takes a page out of Mrs. White’s Golden Rule Café. That’s because it’s the brainchild of Larry White, grandson of Elizabeth White. This spinoff restaurant takes fried chicken a step further by pairing it with secret spices and waffles. That’s right: you can enjoy syrup-doused waffles and crispy fried chicken at the same time. Lo-Lo’s has become a local legend through their inspired menu and their own take on Mrs. White’s chicken. Three words: fried chicken biscuits. That’s all the Welcome Diner needs to dominate the local food scene. Though their classic American fare more than holds its own, it’s their fried chicken biscuits that bring customers through the door. They are made from scratch and come loaded with extras like bacon, chorizo, egg and coleslaw. You can’t go wrong no matter which biscuit you try. May’s Counter has some of the oddest menu items of any local restaurant. There aren’t many places where you can try a waffle-batter-dipped hot dog and fried collard greens. This southern-style eatery may have a diverse menu, but it’s known for two things—chicken and waffles. You can choose between a chicken breast, thigh, wing or leg to pair with your waffles. Wash it all down with one of their famous Bloody Marys’ and you just might reach food nirvana. Or a food coma. Ezekiel’s is a simple soul food restaurant that brings a taste of the East Coast to the Southwest. Specializing in soul food, Ezekiel’s has been a favorite of fried chicken fans for over 30 years. Their white or dark meat chicken accomplishes the rare feat of being crispy on the outside and juicy on the inside. Everything is made fresh, so you might have to wait 10-12 minutes for dine-in or carry out food. But it’s a small price to pay for a slice of fried chicken heaven. There’s nothing lucky about Lucky Wishbone’s success. Established in 1953, they’ve grown from a small Tucson hole-in-the wall into an omnipresent chain with seven locations. Behind all their success is mind-numbingly delicious fried chicken. This fast food restaurant sells all white, all-dark or a mix of drumsticks and thighs. Each combo is served with signature fries and garlic toast. It may not be healthy, but it’s fast, greasy, and tasty. You can try flavors of the American south at Southern Rail. This Phoenix restaurant derives its menu from various stretches of the south including the Carolinas, Georgia, Alabama, Mississippi, and New Orleans. That means no shortage of Cajun food, seafood, and comfort food. Their fried chicken comes with a generous portion of chicken from the wing, breast, and leg. It also comes with Yukon gold mashed potatoes and corn on the cob. Filling, simple, and delicious. Their fried chicken dish does it all. The Larder + The Delta is a hidden gem—emphasis on hidden. It’s located inside downtown Phoenix’s DeSoto Central Market. The entire operation boils down to a couple of stools and a kitchen. But don’t be fooled by its cover. The Larder + The Delta serves up some of the best southern food in the Valley. You can find everything from cauliflower to crispy pig ears on their menu. The real star of the menu, however, is the fried chicken. You can get it in any style including Nashville hot, chicken and a biscuit, and a fried chicken skin po boy. Fried catfish, fried shrimp, and fried chicken. Yes, everything is fried at the AZ Fry Guy. This Avondale hole-in-the-wall dishes up some of the most epic soul food in the state. Their fried chicken is crispy, moist and juicy and will leave you wanting more. If that’s not enough to whet your appetite, you also have your choice of delectable sides. You can find mac and cheese, fried collard greens, and even cherry cobbler at the Fry Guy. Welcome Chicken + Donuts brings new meaning to “KFC”. KFC or “Korean Fried Chicken” is Welcome’s method of twice frying chicken in a light batter with a range of different sauces. 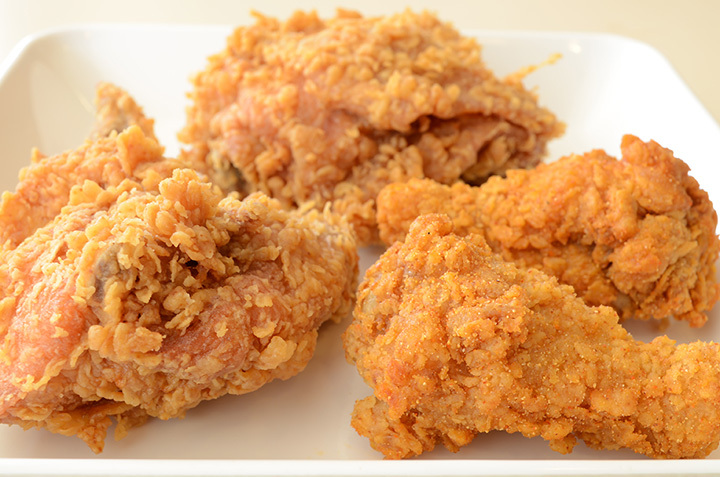 The result is tangy fried chicken with flavors including Korean chili and Japanese barbecue. Did we forget to mention the doughnuts? Welcome is renowned for selling inventive doughnut flavors like chipotle limon, Wisconsin cheddar, and red wine. Come for a doughnut breakfast and stay for a chicken-infused brunch.